OpenRC F1 250% scaled by ColorFabb is licensed under the Creative Commons - Attribution - Share Alike license. We took Daniel's original OpenRC F1 car and made it big! Scaling it to 250% of it's original size means this project is over 1m long and weighs about 8,5kg in total. All of the original files have been modified to work on the larger size as well as accept larger bearings and bolts. To allow remote control of this beast we custom designed a gearbox with a large reduction ratio and redesigned part of the steering arrangement to combine it with a simply massive steering servo. More details about the build and the internal mechanics will be revealed in the coming weeks, but with these files you can already start building your own 1 meter long OpenRC F1 car remix. The full range of copolysters from colorFabb was used, each part produced in the filament which matches with the specific part. XT-CF20 for various chassis parts, colorFabb_XT for the general technical parts, colorFabb_HT for the high-strength technical parts, nGen for the bodywork and nGen_FLEX for the tyres. This print is not for the faint-hearted and requires a big printer to print the body and chassis parts. For this job we used the Stacker S4 and we needed all of it's XY build volume to complete the biggest of parts. Some smaller parts were printers on various other printers, mostly Ultimakers. Print resolution and infill levels based on the specific requirements of the parts. Chassis parts mostly printed with 100% infill whilst many body parts only need a small percentage to support the structure. Some parts will require support to be printed properly but most parts should print support free thanks for the awesome original design by Barspin! Daniel Norée has a lot of documentation about his OpenRC projects and how to build the F1 car. Take a look at his Youtube channel for example and especially his Build With Me - F1 series. Combined with the original assembly drawings should allow you to build most of the car. This project is based mostly on M6 countersunk bolts and M6 Nyloc nuts. Make sure you have plenty M6 available between the lengths of 25 - 40mm and be prepared to cut some to size. Customized parts also use M3 brass heat set inserts for the servo mount and gearbox as well as M3 grub screws and 8mm steel rod (or M8 threaded rod) for the gearbox. The steering arrangement has been beefed up to allow this much heavier machine to steer properly. We used the Turnigy™ DMS-30 Steering Servo which we hooked up straight to the battery to provide enough steering power. This new system requires you to remove large parts of the inside wall of the body work which is not incorporated in the 3D files. Using the top linkage on the servo saver also effectively overrides the saver mechanism. We found the servo strong enough to work in normal operation and overriding this ment losing a lot of play inside the mechanism. Due to the heavy weight it's important that the front axle has a bolt running through it all the way. Since the bolts are coming in from both sides it's important to make sure they line up inside. Use at least an M6x40 countersunk from the outside in to give it enough strength. This custom designed gearbox allows us to use a motor intended for the original size on this 250% scaled version whilst still having enough speed for a fun experience. This is the EZ-RUN Brushless Motor 9T 4300Kv. It uses custom length GT-3 belt and printed gears. The gaps between the gears and the mount is shimmed out with standard 8mm washers and each gears has two M3 heat set brass inserts with grubscrews holding it into place on the shafts. Two of the 688 bearing are inside the motor gear, which allows the shaft of the final reduction stage to support the motor gear. The other two 688's support the other end of the same shaft as it moves outside of the body to the final gearing. Every project needs LEDs, especially a race car! 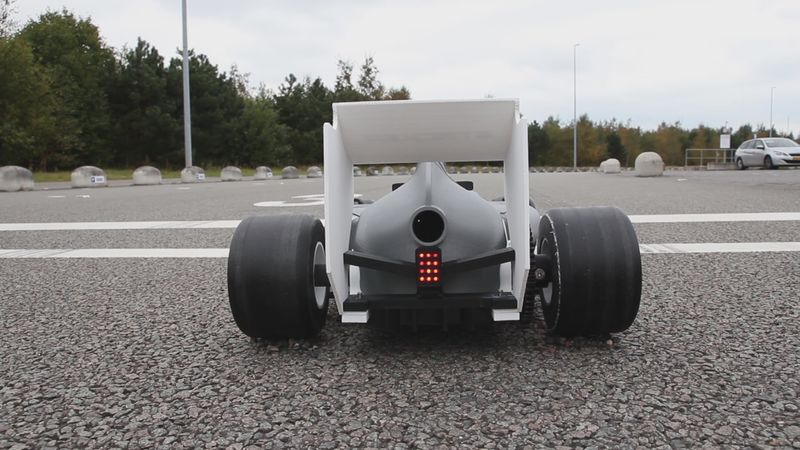 We reproduced the same lights as an actual F1 car has by mounting 3x4 LEDs in the rear wing mount. Combined with a small power converter being powered straight from the battery this adds a simple but really cool finishing touch to the project. We took Daniel's original .step files as a basis for scaling this model. He build up this entire project from scratch using Autodesk Fusion 360 CAD software. We continued the work in SolidWorks 2016 to scale up and modify the parts where needed. The gearbox has been designed from scratch in SolidWorks. The OpenRC project was started by Daniel Norée in 2013 and it has produced some amazing 3D printed projects over the years. 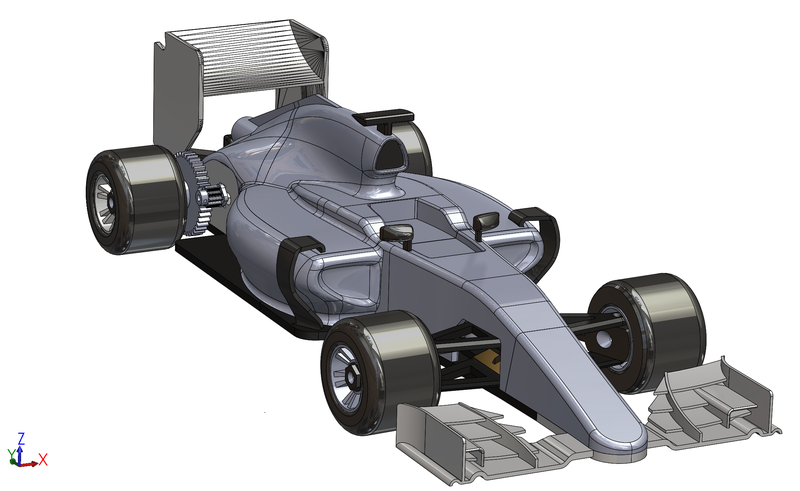 With the F1 car as the newest addition to the OpenRC fleet colorFabb decided once more to tackle an OpenRC buld, but this time a bit bigger. We have been in contact with Daniel throughout this build and we can't thank him enough for all the work he has done on this and many other 3D printable models. We can't wait to see what he comes up with next!